The Patreon Integration is now public. To set up Patreon Integration with your comic, head on over to Comic Management, and you'll see a new menu item for Patreon Settings. There, you'll be able to connect your Patreon account to Smack Jeeves and associate a Patreon campaign with your comic and set up all kinds of neat things like Bonus Content and allowing your visitors to log in with Patreon. 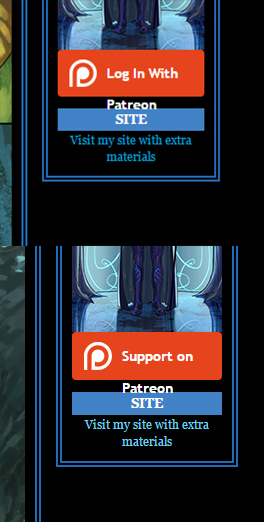 Doing so will also enable the Patreon widget on your comic profile. As usual, feel free to post any questions/comments here or in the Help forum. This is great, I love the level of customisation! I can't wait to play about with these options a bit. Oh sweet! I had no idea what sort of rewards to set up with Patreon, but now I can set up early access! This is awesome! It only works for patrons with a SmackJeeves account though? Respheal wrote: Oh sweet! I had no idea what sort of rewards to set up with Patreon, but now I can set up early access! This is awesome! Nope, any of your readers (with a Patreon account, obviously) can use the feature! They can be "guests". Ehh, there seems to be a bug then. I set up a test patreon account and a test SJ account and I wasn't able to view the early access page unless I was logged in with my test SJ account and it didn't toggle the "logged in with patreon" switches until I logged in as the test account. Replication details: Log in on patron, DON'T log in on Smack Jeeves, click "Log in with patreon" button on comic page, click 'allow', it redirects back to the comic page, but no access to the early access page. This one's a bit weird because it works fine (logged in on Patreon, not logged in on SJ) for Mokepon for example, but not on my own comic? Maybe the custom domain is messing with things? Edit: It's DEFINITELY the custom domain mucking things up. Tested out on my template-test comic that doesn't have a custom domain and it works fine. - Be logged in on Patreon (and not subscribed as a patron for the comic using to replicate), but not Smack Jeeves. Did you remove the Patreon login button? I'm not seeing it on your site to test. It should be there? It's under the comic page but above the comments. Ah, okay, that might be a bug as well. Looking into it. Respheal wrote: Ehh, there seems to be a bug then. I set up a test patreon account and a test SJ account and I wasn't able to view the early access page unless I was logged in with my test SJ account and it didn't toggle the "logged in with patreon" switches until I logged in as the test account. OKAY! I fixed it! You were right, it was because of the custom domain, although that was just kind of exposing a different bug that was the real problem. Also, you had a few weird conditionals around your Patreon log-in button and your page title - that's why I couldn't see the Patreon log-in button. So I removed the conditionals because they didn't really make sense being there. And I updated your Comic and Overall Layout templates (added CSS to overall layout) a bit to just make the Patreon button fit in slightly better. Probably still room for improvement, but I'll leave that up to you to do what you wish. Awesome, yup, you fixed it! Thank you very much! And heh, thanks for adding in the CSS. I am a bit lazy and hadn't gotten around to prettying up the Patreon button. The Warning: Invalid argument supplied for foreach() in /home/[youruser]/public_html/includes/classPatreon.php on line 1035 bug is still there, but it goes away after a refresh so it's not too big of a deal. Respheal wrote: Awesome, yup, you fixed it! Thank you very much! And heh, thanks for adding in the CSS. I am a bit lazy and hadn't gotten around to prettying up the Patreon button. I'm not getting that error following the steps you listed - it may have to do with you logging into the same Patreon account multiple times in different sessions. Is that a possibility? EDIT: Ah, nevermind, created a new Patreon account and now I'm seeing it. Thanks, will definitely look into this. EDIT 2: Okay, that one was actually an easier fix. Thanks again! But I found a small problem with Kingly Grunge template. The word "Patreon" goes out of borders when the button for logging or supporting on patreon changes to the template settings.